Labor Day weekend has come and gone, it’s now unofficially fall, and for some of you readers that really only means one thing — football season. Personally, I could give two shits about football, I’m just excited that MLB playoffs are around the corner, but I’m really just alone on my baseball island probably 🙋. Anyways, so this week I wanted to share with you some news, well it’s not really new like fresh off the press news, but it’s relevant, I promise. 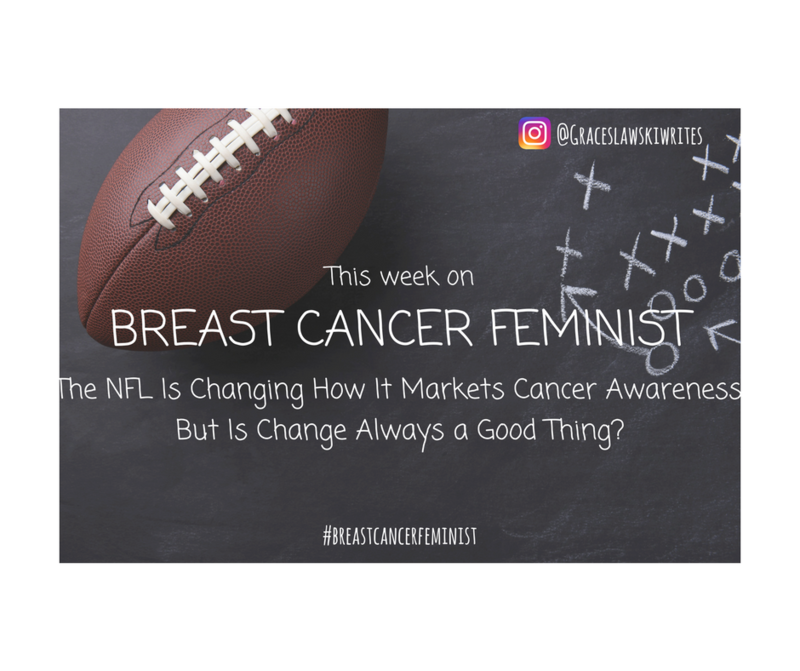 Back in December, Sports Illustrated reported that for the 2017 football season, the NFL will not be focusing its October cancer awareness campaign exclusively on breast cancer. Since 2009, the NFL has partnered with the American Cancer Society to fill football fields across the country with pink breast cancer ribbons, pink uniforms, and other pink merchandise for consumer purchase. This year, their “A Crucial Catch” initiative will allow teams to choose a detectable cancer to promote during a three-week window in October, or approximately 18% of their total scheduled games. The NFL launched the “My Cause, My Cleats” campaign in 2016, which allowed teams to wear customized cleats that shared a common message for one game. This revamping of the “Crucial Catch” campaign coincides with what “My Cause, My Cleats” aimed to achieve and reflects the NFL’s break from a homogenous breast cancer marketing campaign that it’s championed for almost a decade. According to the article, the change also reflects the league’s decision to allow players to have more of a voice. I wasn’t sure what to make of this news. At an initial read, I’m certainly relieved that the pink ribbon explosion won’t be returning to football fields this pink October. But that relief was fleeting. I’m going to do an abbreviated deep dive into why this pink breast cancer awareness campaign is untrustworthy because I promise (pinky promise!) it all comes in full circle. The NFL has garnered a sizeable amount of bad press for its disingenuous donation practices. Most people probably haven’t seen the bad press because to be honest, since there’s such a cult of loyalty surrounding the NFL I’m not sure most people really care. But for the true hearted and courageous souls out there that are willing to look past this illusion of the NFL, the criticisms are real, and have even come from within the sports industry. So wait, what does that look like then? You can see the pie chart below that gives the full break down of what Gaines is talking about. Definitely a departure from then”100% of proceeds goes to the American Cancer Society” slogan they’d advertise, doesn’t it? Graphic credit of Business Insider, image not my own. “The money that we receive from NFL has nothing to do with our research program,” ACS spokeswoman Tara Peters told VICE Sports. All NFL donations go to ACS’ CHANGE program, through which the organization awards grants to “community based health facilities” located within 100 miles of an NFL city for educating women about breast health. Our campaign, “A Crucial Catch,” in partnership with the American Cancer Society, is focused on the importance of regular breast cancer screenings. Throughout October, NFL games will feature players, coaches, and referees wearing pink game apparel, as well as additional on-field and in-stadium branding — all to help raise awareness for this important campaign. Much of the apparel worn at games by players and coaches, along with special game balls and pink coins, will be auctioned off at NFL Auction, with proceeds benefiting the American Cancer Society’s Community Health Advocates implementing Nationwide Grants for Empowerment and Equity (CHANGE) program. Since 2012, CHANGE grants have been awarded to community partners to provide education, outreach, navigation and access to cancer screening within communities experiencing an unequal burden of cancer. These community partners have provided more than 260,000 outreach and education engagements and have contributed to more than 120,000 breast cancer screenings provided at low or no cost. This life-changing work continues in 2016 with the goal of providing breast cancer education and screening resources to even more women. Prevention and early detection programs such as the CHANGE grant program bring us closer to the vision of a world free from the pain and suffering of breast cancer. Ok, so it doesn’t look like in the last years any of the money that was donated to the ACS was used for research. Maybe that doesn’t bother you, but it bothers me because it’s become the understated public narrative that the NFL’s attention towards breast cancer awareness will lead towards finding a cure…except it isn’t. It hasn’t been for at least the last four years of this campaign. I’m not sure what has caused all the confusion, but it’s certainly confusing! OK, so if you’re still with me, congratulations. I’ve laid out a pretty well-documented case that shows how the NFL’s “A Crucial Catch” campaign is not as iron proof as you’d want to believe it is. So why did I do this? Well, the better question might be, what’s stopping from the NFL from using this model again and again and again for all of the other cancer intitiatives it plans to support this year? Let’s face it, the NFL is a ‘not-for-profit’ organization that’s so heavily involved in cancer awareness cause related marketing because the league wants to build credibility within its fan base to ultimately keep people coming to games. Now, there’s nothing criminal about that, in fact cause related marketing is thought to have a huge payoff in the marketing world if done correctly. But what’s nerve wracking about these changes being made to the “Crucial Catch” campaign is that none of the changes impact the issues I just described about transparency. They’ll donate money to several cancer awareness causes I’m sure, but they’re only multiplying this model that not only is misleading, but is largely ineffective in raising money to begin with. Then there’s this other point that the dark cynic in me cannot ignore. Another big point of contention is that one of the money is actually really going to research programs. 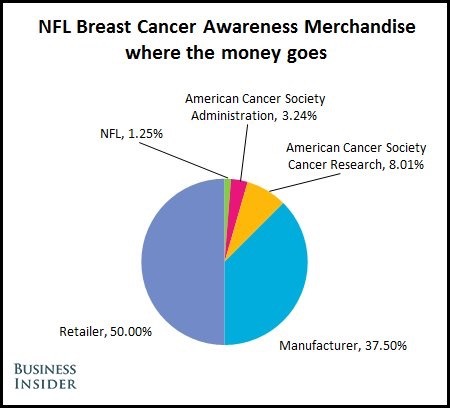 But would the NFL want to actually raise money for a cure to breast cancer, because that signal the end of this revenue stream? Does the NFL have an incentive to find a cure for any cancer at all? Lastly, I want to circle back to a point that I made earlier. The NFL claims that the changes being done to the “Crucial Catch” campaign are allowing players to have more of a voice. And that sounds nice and all, but I think that’s a little bit of a facade. Am perfect example of that is Steelers player Deangelo Williams who in 2014 lost his mom to breast cancer. When he asked the NFL if he could wear pink all season to honor his mom, his request was denied. How much of a voice is that? This just seems like a way for the NFL to try to loosen the reigns a little bit, but not really. This is still about the NFL’s reputation and bottom line at the end of the day, not about cancer awareness for the sake of cancer awareness. Steelers RB DeAngelo Williams wanted to wear pink all season to honor his mother who lost her battle with breast cancer. The NFL said no. So I had a co-worker joke with me once and tell me that I never pose solutions for my otherwise scathingly critical posts. Fair point. And to be fair, like I’ve said before I’ve had to grapple a lot with the reality that the pink ribbon movement, and more broadly cancer awareness campaigns as a whole, aren’t going anywhere anytime soon. So, could the NFL implement any positive changes to their “Crucial Catch” campaign? I have one change that I’d like to propose, but before I get there I need to provide a little context. While my answer on the surface appears to be simple, in reality it’s not. The entire model for how money is fundraised during this campaign is in some ways outdated. It’s based on more traditional marketing practices that are one-sided. The NFL tells you what to support, you see the merchandise on TV, and you go to the store and buy similar merchandise. Now, the NFL has used online shopping to promote these products. You can livestream the games over the Internet so you don’t need a tv. And their campaign is displayed on social media sites. The NFL has obviously modernized its approach to marketing its “Crucial Catch” campaign. But just because their marketing is modernized doesn’t mean that they’re not utilizing a more traditional approach. And I would like to argue that model is outdated. Instead, I would propose that the NFL use more of an internet marketing approach that views the players as influencers and allows the players to actively engage with fans in conversations online. You see that people, especially younger generations, gravitate towards video platforms that allow them to feel more connected to the people they follow. Similar to the ACS Ice Bucket challenge, money could be raised from the ground up, without needing to refund retailers or merchandisers. It’s more authentic, and it’s more real. All it would take is the NFL allowing more trust in its players. So, this fall when you’re at the bar or cozy in your living room or live streaming a game on your laptop, and you see the cancer flare on the field, try to ask yourself if these changes are good, if they make sense, and if they really do make a difference in saving someone’s life with cancer.